You see, a few weeks ago, one of my bffs and fellow bloggers, Ash, did this nifty little thing on her blog. She’d gotten it from someone else and the idea is to keep it going. Yep. 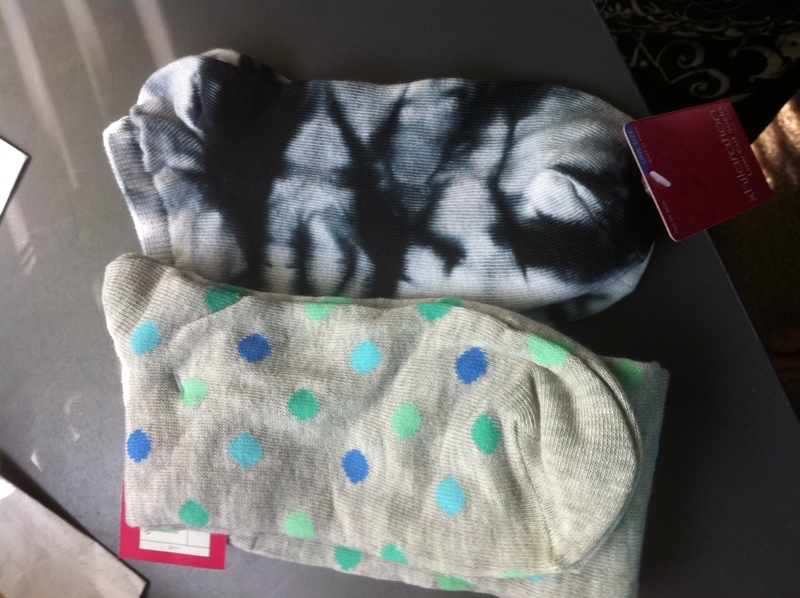 They’re awesome socks. And if you’ve ever looked in my sock drawer, you know they’ll fit in well with their neighbors. I think I have maybe 2 pairs of white socks. It’s sad really. The idea of this thing is to not only get to know other bloggers, or the visitors to the blog a little better, but, uh, HELLO? Who doesn’t like mail? Especially when it’s got a surprise in it! I promise it will be awesome. 1. The first THREE commentators on this post will be my three “Pass it Forward” recipients. Stipulation: You must have a blog to participate. 2. I will contact the THREE commentators to get their home address, and then ship out a fun little gift. 3. You must then be willing to host a “Pass it Forward” on your own blog for THREE blog commenters. Please make sure to include your email so I can contact you for your address. And if you aren’t a blogger, figure out another way to pay it forward. And tell me in your comment how you’ll do it! Okay you KNOW that I read your blog and it usually keeps me pretty entertained! I always enjoy when you post something and BOOM it’s in my inbox! Oh and BTW my pet peeve are those stickers on cars as well! They can get a bit CREEPY! Anyways, BLOG ON & I hope you read mine too! Laura! This is such a great idea! I’d love to give it a try on my own blog 🙂 I hope you get tons more traffic here because your blog cracks me up and keeps my mood high! 🙂 Love it! So I started reading this blog because I know you personally, but I keep reading it because every post literally makes me laugh out loud! I wish you posted more often so I could get a little bit of Laura in my life everyday. 😛 Maybe I could pass it forward by surprising some friends with a little gift in the mail?